Tired of drinking your morning coffee? Why not eat it, surrounded by chocolate? 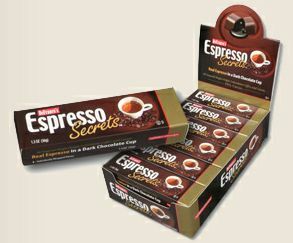 That’s one idea for enjoying DeFranco’s Espresso Secrets, anyway. And wouldn’t that be faster, tastier, and reduce your chance of getting burned? Of course it would. And if you put a crazy amount of sugar in your coffee (like, 14g), then it’d be about the same calories, too (160). Okay, enough numbers. Almost. This 1.3 oz/36g package contains three good-bite-sized pieces of 55% dark chocolate, with a coffee center. If you want a caffeine kick, you better eat all three. But how’s this candy taste? Not bad at all! Bite through the pretty thick dark chocolate layer, and you hit the semi-liquid coffee center. It’s a little gooey, but doesn’t drip all over the place at room temperature. (In other words, you don’t have to throw the whole thing in your mouth at once if you’re a nibbler.) And what sets this coffee candy apart? The coffee is real, not just a flavor, and it’s just over the edge of bitter. Wow, they’re not messing around. But when you taste both the dark chocolate and gelatinous diner coffee together (as you should of course), DeFranco’s Espresso Secrets is actually a nice little treat.